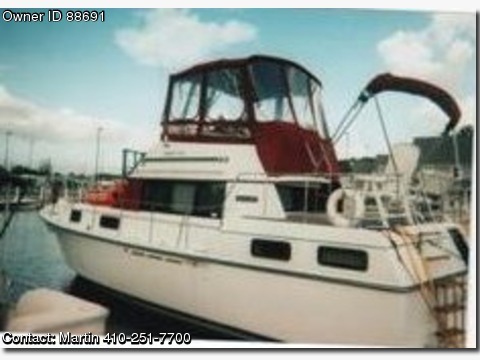 BOAT OWNER'S NOTES: for 1988 CARVER MY in VERY GOOD Condition, call boat owner Martin @ 410-251-7700. OVERVIEW: This 365 Carver is a gentle handling craft for its size with the pleasure of fuel economy on a slow cruise or the power to get there when you need it S boat that is GREAT for the bay or ocean. DESCRIPTION & LAYOUT: With twin engines 350 hp each it still can be light on the fuel budget for a day of easy cruising, and a fuel capacity of 200 gallons, The LOA of 40 ft is very easy to dock using the twins, With a full galley, large refrigerator high output ice maker, microwave, and two burner electric stove, there is plenty of room for cooking for your family and friends, The dinette will seat more then six people and this beauty has a large salon as well, When you head back to the master suite you will find that the queen size bed is comfortable and you have lots of storage including a full closet, Your own personal bath with tub/shower, head, and sink, The bow has the traditional V bunk for two and a walk through bath with sit down shower and sink, Above deck in the helm you have the standard gauges plus GPS, fish finder, and VHF. this area has plenty of space to sit four plus, there is the covered open deck on the aft that can accommodate lots of seating, You'll find plenty of fresh water and space for waste. If you have any questions about my boat feel free to call me @ 410-251-7700.